For tourists who have gone to the Samaria Gorge, which is one of the most popular trips in the western part of Crete, the white buildings of Agia Roumeli emerging at the end of the trip are one of the most pleasant views that they will see that day. For most people, the passage of a dozen or so kilometers of trail leading through the gorge is so bad that the opportunity to rest, or drink a cold fresh juice squeezed out of oranges seems to be invaluable. It is at Agia Roumeli that a long hours of wandering through Samaria, the longest gorge of Crete and Europe, ends. This coastal town is located in the south-western part of Crete in one of its wildest regions, which is famous for its rare specimens of fauna, flora and geological formations. On the one hand, surrounded by the amazing high peaks of the White Mountains, and on the other closed by the blue Libyan sea. This natural isolation means that Agia Roumeli is one of those towns of Crete, which can only be reached on foot or by boat. 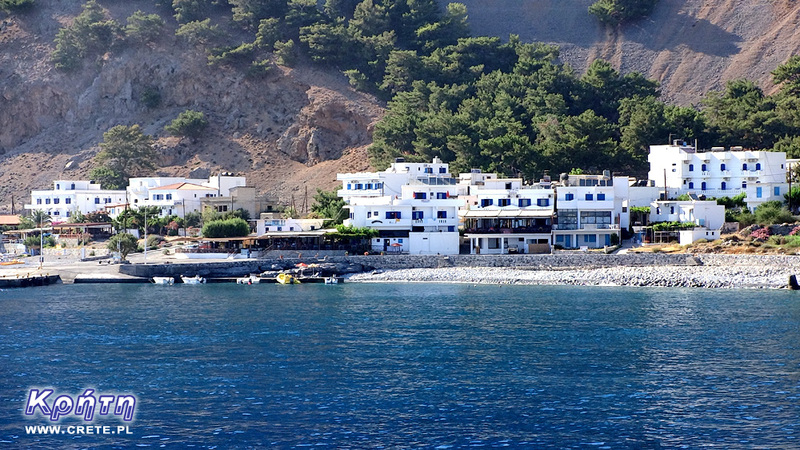 The permanent residents of Agia Roumeli have relatively few, their total number oscillates around a hundred people. However, during the summer it is one of the more crowded and noisy places in Crete. This should not be surprising because it is here in the high season almost every day meets more than a thousand people, which after passing the ravine Samaria and waiting for an afternoon ferry regenerates its strength in one of the many taverns located in this town. Despite the fact that the lower floors of almost every building are allocated for this type of premises, it is difficult to find a place in the late afternoon, especially in the central part of the village. Although most tourists still treat this place as only one of the points of a tiring one-day trip, there are more and more regular fans of this place who rent rooms in one of the many hotels and stay in this place for a little longer. It is a great way to get to know Agia Roumeli and the surrounding area, because only after departure of evening ferries you can experience the uniqueness, incredible calm and Cretan character of this place. Wild nature, uncontaminated nature and the isolation of Agia Roumeli from the outside world is a perfect recipe for an interesting and unforgettable holiday. You can find here not only tourist trails, secluded beaches, but also the tranquility that is missing in the tourist towns of Crete. The Roussos Viglis, one of the permanent residents of Agia Roumeli, is also an active recreation in this region. He created the 4-day program Samaria Exprerience, which combines active mountain tourism with the opportunity to learn about the rich history of this beautiful place. As part of the program, workshops are organized to show the everyday life of the former inhabitants of the ravine. Tourists under the eye of Roussos Viglis have the opportunity to learn the art of preparing traditional Cretan dishes based on local ingredients. During the hiking on the routes crossing the surrounding mountains, the participants of the program learn about traditional Cretan herbs and have the opportunity to take a look at work in local apiaries. The unusual feature of this offer is also the fact that Roussos Viglis with his family for generations lives in Agia Roumeli, and his father lived in the now abandoned village of Samaria, which hikers pass on the trail. So this is a man who knows everything about this region of Crete. However, if you can not afford a longer stay in Agia Roumeli, it is worth staying here after passing Samaria even for one night. It is only when the crowd of tourists leaves and the everyday noise fades away and the time comes to appreciate the charms of this place. On a pebble and quiet beach you can watch the sunset and twilight, and later enjoy culinary specialties in one of the many local taverns. This is a good place to look at the sky, where stars shine here particularly intensely. Hotels located in Agia Roumeli are usually small family-owned enterprises, which in addition to rooms decorated in a simple Greek way, also offer delicious Cretan cuisine and famous Greek hospitality. Prices in the high season are not excessive, and a double room can be rented from 35-40 € per night. It is worth noting that some hotels also accept the presence of pet pets. Although the townThis is located in a quite secluded place, the isolation is not so complete, because you can easily find access points for wi-fi networks that allow you to connect to the Internet. With a slightly longer stay, small purchases can be made in one of the two local mini-markets. Of course, due to the location of Agia Roumeli, the selection of products offered by these stores is somewhat limited and quite selective, but you can easily buy all the basic things in them. If you decide to have a short stay in Agia Roumeli, one thing is certain - you will not have time to get bored. This place is simply perfect for people who like hiking. On the nearby hill above the village you can visit the ruins of the Turkish fortress. From here, there is a view of the mouth of the gorge, the white houses of Agia Roumeli and the beaches and the sea. The walk itself is not particularly difficult. A little further there are the ruins of the second fortress, but it is in a pretty bad condition. 3.5 km east of the beach you will find the small Byzantine church of Agios Pavlos. For more persistent walkers, the challenge may be walking to the Marmara beach (4 hours) at the exit near the Aradena ravine, then further to Loutro (5 hours), from where the path to Chora Sfakion (7 hours) also leads. With Agia Roumeli also runs a longer route towards the west to Sougia. However, it is only recommended to people with experience, good condition and without fear of heights. In places the path is badly damaged, so it may be too difficult for an average tourist to walk. Both directions are basically a part of the E4 route, which simply runs through Agia Roumeli. In this village for the most part of the day you can enjoy an empty beach that fills up slightly in the afternoon. Sun loungers and umbrellas are rented on it. There is also a possibility to take a rented boat in the east direction to Marmara, Glyka Nera and Loutro , as well as to the west: Domata, Kalogeros or Trypiti. Formerly Agia Roumeli was located inland near the entrance to the Samaria Gorge. However, in 1954 there were such heavy rains that the river flowing through the ravine caused huge damage to the village. During this period, a decision was made to move the town to the current location closer to the coast. In ancient times, near the modern Agia Roumeli, there was the city of Tarra (or Tara). It was an important religious center of Dory, and its greatest development was in the Greco-Roman period. During the Roman occupation, the city was fully independent, an example of which was even its own coins. Excavations that were carried out in the area of ​​the modern village allowed the discovery of the ruins of an ancient cemetery. The bay over which it was located probably played the role of its port. However, this was not finally proved, because after the great earthquake that took place in 365 AD, the western part of Crete rose by about 4 meters. Nevertheless, these are the assumptions and assumptions of archaeologists. This place also has strong links with Greek mythology. The Tarra was revered by Apollo, who apparently was here just looking for a shelter after the python snake-killing and after taking over the oracle in Delphi. In this place there was also a fiery romance between Apollo and the Cretan princess Akalle. The sons of this relationship were abandoned in the mountains and fed by wild goats. The large amount of trees and the presence of the river meant that during the Venetian and Turkish times, Agia Roumeli was an ideal place to build ships. In this period, sawmills and a shipyard were built here. The city also found its place on the pages of history written by World War II - it was from here that after the fall of Crete in 1941, the King of Greece, George II, sailed away from Egypt. The origin of the name of this place is ambiguous, according to one of the most interesting theories the genesis is the Arabic words AIA (water) and RUMELI (Greek) which can be translated into Greek Water. Agia Roumeli is located on the southern coast of Chania Prefecture, between the villages of Chora Sfakion and Paleochora. The specific location between the White Mountains and the Libyan Sea makes it impossible to reach by car. To get here you have to go on foot through the Samaria Gorge. On average, overcoming this long and tiring road takes about 6 hours of walking at a moderate pace. The second opportunity to get to Agia Roumeli is a sea route, which is definitely more convenient and faster. In summer, the ferry network is quite large. Several times a day, ships arrive from Chora Sfakion , calling Loutro, which is a dozen or so kilometers away. In the morning there is also a ferry from Paleochora, calling on the road to Sougia. In the evening, both ferries perform return cruises. Ticket prices for adults are around € 10 for a cruise from Chora Sfakion and € 14 for a cruise from Paleochora. 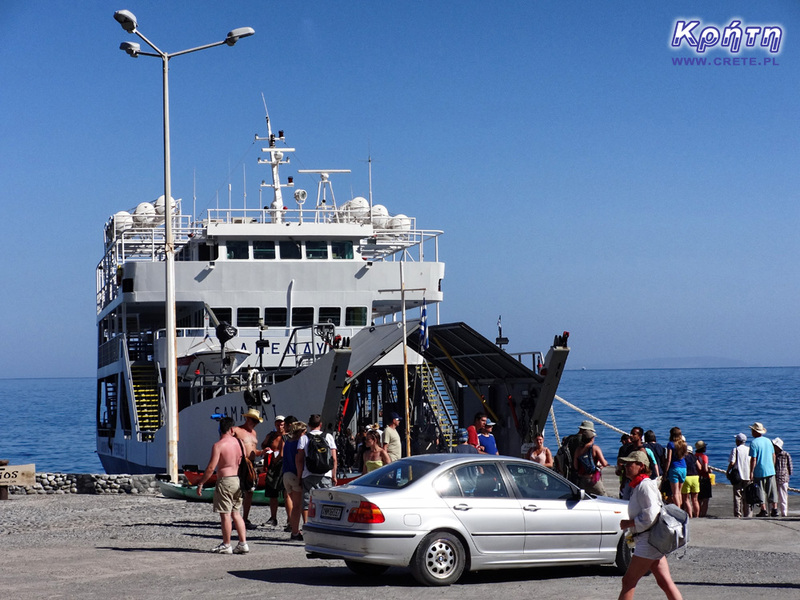 The ferry from Chora Sfakion to Agia Roumeli flows an hour, while the cruise from Paleochora is slightly longer and lasts 1.5 hours. With the advent of late autumn, from the beginning of November to the end of March, the frequency of ferries travels drops to 1-2 flights a week (2 cruises from Sfakia, 1 from Paleochory). This is quite a challenge for the permanent residents of Agia Roumeli. In addition, this situation is further aggravated by storm days often occurring during this period. Bad weather conditions combined with high waves prevailing at sea make these rare cruises sometimes canceled. A ta kąpiel w morzu po przejściu wąwozu- rewelacja. I świeżo wyciskany sok z pomarańczy. Wystarczą dobre buty i chęć nie ma znaczenia wiek , należy tam być!!! Przejście wąwozu Samaria jest "punktem obowiązkowym" w czasie pobytu na Krecie. Kto tego nie zrobi nie wie jak piękna jest Kreta. Oj to faktycznie bardzo słabo. W naszym najnowszym opisie wycieczki do wąwozu Samaria, zachęcamy właśnie do korzystania jednej z wielu tawern znajdujących się w głębi Agia Roumeli. Mam pytanie. Czy można się dostać z powrotem z miejscowości Sougia lub Paleochora do miejscowości Omalos??? Gdyż chciałbym tam przyjechać autem aby zejść w dół wąwozu, następnie prom. Patryk, wedle rozkładu umieszczonego na stronie masz możliwość skorzystać z autobusu, który o 18.30 jedzie z Sogia do Omalos. Autobus czeka na przypłynięcie promu, więc jest to tylko orientacyjna godzina odjazdu. Fantastyczna sprawa. Tatry i morze w jednym miejscu :) W 1996 roku w maju przeszliśmy z żoną ten wąwóz i pamiętam jak dziś ten niesamowity widok krystalicznie czystej wody w zatoce po wyjściu z wąwozu. Teraz też może uda nam się znaleźć czas by w tę majówkę przejść cały wąwóz. Maj to dobra pora. Nie jest tak gorąco. Jak będziesz miał do dyspozycji tydzień to polecam przejście E4 z Hora Sfakion do Elafonisi - bardzo ładny szlak w sam raz na majówkę. Poza odcinkiem Aghia Roumeli - Sougia ( który jest dość trudny, a przede wszystkim nie ma gdzie uzupełnić wody - trzeba wziąść ze sobą zapas na dwa dni marszu) nie ma jakiś większych trudności, można iść tak by znależć na nocleg zawsze jakiś pensjonat, a można spokojnie spać na plażach, jak nie czujesz się na siłach iść z Aghia Roumeli do Soughii to zawsze można go obejść - podchodząc Samarią w górę na Omalos następnie schodząc do Soughii przez wąwóz Aghia Irini. Polecam wszystkim jako początek chodzenia po kreteńskich górach - jak przejdziesz to dalej już pójdzie "z górki" - Białe, Idi, Dikti i inne. Chciałbym jeszcze jedno dodać do tych informacji - jeśli ktoś wybiera się pochodzić po górach Krety polecam mapy turystyczne wydawnictwa Anavasi - dostępne są Góry Białe podzielone na 3 części, Idajskie, Dikti, Asterousia i wschodni kraniec ( po nazwą Zakros - Vai ) mapy w skali 1:25000 i 1:30000, dobrze czytelne. Szlaki są znakowane różnie - akurat E4 nadmorski w Górach Białych był kilka lat temu poprawiany i jest niezły, ale ogólnie to rekomenduję GPS, może być z telefonu ( ale wtedy niezbędny silny powerbank). Ślady GPS dostępne np na Wikiloc.com, a mapy Anavasi możne kupić w wersji cyfrowej w aplikacji Avenza Maps - ja korzystam równolegle z obu wersji. Agios Pavlos is a small town located on the southern coast of Crete near Saktouria (Σαχτούρια). Despite the relatively good access and a small distance separating this place from the crowded and crowded tourist Agia Galini, they can still be called an oasis of peace. Sougia is a small town located in the southwest of Crete. This place is still outside the main tourist trail. Not counting tourists returning from the Samaria gorge, this place is visited by a few people for whom peace and quiet are an advantage and not a disadvantage.